Cutting Mat Board Yourself Makes Cents!! Cutting mat board yourself seems more intimidating than actually making your own picture frames! Many people gladly hand over 4 to 5 times more for pre-cut mat board without ever considering cutting their own. That's too bad. Cutting your own mats can save you a lot of money - that much everyone knows. What most people don't know though is that with a few simple tools and a little bit of know-how, it's a VERY VERY easy process! The hardest part is just getting started. Once you do, you'll wonder what took you so long! Protection – a mat also offers protection by keeping the artwork or picture from coming in contact with the glass. This can prevent potential damage such as sticking to the glass in humid conditions and ruining the item. It also allows air to circulate around the art or document. I did a quick search for pre-cut mat boards in art stores in my area. I found a cheap 11 x 14 standard mat with an opening for an 8.5 x 11 document. There were many others that were more expensive. Depending on where you live and what your tax rate is the cost will vary, in NY I this one goes for 4.88 including tax. Now for the real savings - cutting mat board yourself. 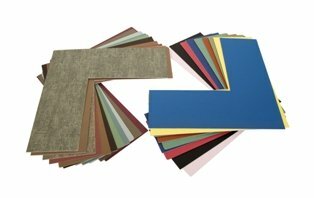 From the same art store you can purchase a full sheet of standard mat board, which comes in many different colors and textures, for approximately $13 with tax. Out of that one sheet you can cut six 11 x 14 mat boards. If you bought six at $4.88 that would cost $29.26. A nice savings of approximately $16. "yeah but I've got to buy the equipment to cut it". That's true, but my guess is that you're on this site because you have an interest in making more than one frame or more than 1 mat. If I'm right, you'll pay for any equipment you have to buy very quickly. As you'll see, a mat cutter can range from less than $20 up to several hundred dollars. Whatever your budget, there's something there for you. I started out cutting mat board with a very cheap handheld mat cutter. I now use a full cutting system which has been paid for over and over again - not to mention the fact that it saves a lot of time. Before you begin cutting mat board learn what kind of frame matting you should use.